Ivor Abrahams was born in Wigan, Lancashire, in 1935. He studied at St Martin’s School of Art (1952-1953) and at Camberwell School of Art (1954-1957). Having taken up sculpture in spite of parental opposition and supported himself through art school, Ivor Abrahams worked in London and traveled whenever he could to see painting and sculpture in galleries throughout Europe. He began to teach part-time whilst he pursued a largely figurative way of working, and had one-man shows regularly from 1962 in Europe, Scandinavia, New York and Toronto. In a continuing mission to make work that is accessible, Ivor Abrahams has rarely made sculpture that is purely abstract. First the figure, then gardens and classical landscape, then the sea entered his repertoire, only to be replaced again by the figure, until today when he is still drawing on his own environment, but in different ways. Portions of buildings, gardens, domestic interiors and people – usually active – inhabit works that are fundamentally collages. These are built of photographic images that are cut, altered, painted over and turned into three-dimensional form. Further works evolve from these assemblages in clay or resin. Some are painted; others are cast in bronze and then painted freely or patinated with great subtlety. Advertising placards have always held a fascination for Abrahams, as he once worked as a display artist for Adel Rootsteine in the late 1950s. The illusion of three dimensions that these placards convey is brought into his constructed sculptures as part of the process of developing an idea for sculpture, or even as an end in itself. Abrahams, with his French wife Evelyne, bought a house in Pézenas in 1973, but has not lived there all the year round. They kept a home in London, and have recently moved back to Britain as their primary working base. In 1989 Abrahams was elected to the Royal Academy. Ivor Abrahams’ early bronzes were shown as a group in his first solo exhibition at Gallery One in London, 1962. Some of the pieces were cast by him, others at the Fiorini Art Bronze Foundry, where he worked as an apprentice in the 1950’s. After the first one man show, IA makes a radical change in his working methods and sources. Working in the display industry he starts to work directly in plaster and latex. A growing interest in Di Chirico sees him adopt the Figure and Ground format he is to revisit periodically. The Garden theme in the sculpture of I A represents the period when he gained his international reputation. Works were in many materials and on a large range of scale. He also made many prints, drawing and ceramics around this subject. The theme of Bathers shows IA giving priority to the figure from about 1979 onwards. The shift from the garden to figure and ground subject matter was more important to the artist as an adjustment in sculptural language, rather than the obvious change of subject. The Seascape sculptures show a progressive development of the figure/ground theme, which coexisted in the work for some time. They represent a perfect counterpart to the vernacular garden images of the nineteen seventies. In the mid-1980’s IA started to work with dancers and gymnasts. His images developed initially from photography and videos, later, he worked directly with dancers, producing many works in print, bronze, ceramic, drawing and animated film. Head forms began to appear out of these constructions and poly-morphous aspects began to make an appearance. A commission from the Hague for a sculpture for the ‘Carnaval des Animaux’ exhibition in 2000 led Abrahams into a new direction. Using his urban imagery and the collage method, he produced the ‘Cockerel’, which was eventually bought by Chatsworth. 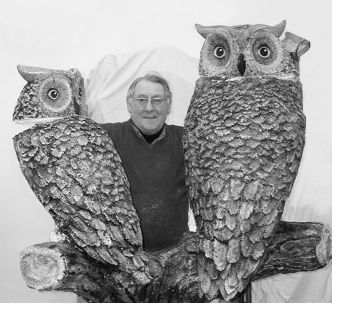 This led to further bird sculptures, in particular ‘Urban Owl’ in 2003.